Denial and Utopia, the 1st National Performance Art Show at Ex Teresa, seeks to create a highlighted platform for mexican performance artists. Mexico, with its rich cultural heritage and an impressive diversity within performance art, has much to offer, but the international visibility of mexican performance artists is yet to be developed to its full potential. Originally based on an idea by former director Carlos Jaurena, it will be a biannual event, taking yearly turns with the already well established International Performance Festival at Ex Teresa Arte Actual. This first edition of the show will focus on the critical reflections of 12 selected artists regarding different aspects of the experience of being mexican. 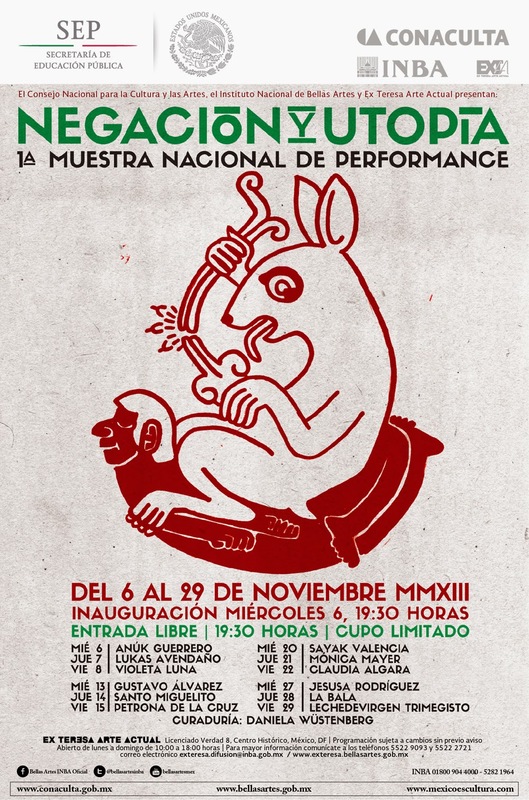 Participating artists are: Jesusa Rodríguez, Mónica Mayer, Gustavo Alvarez, Violeta Luna, Lechedevirgen Trimegisto, Sayak Valencia, Petrona de la Cruz, Anúk Guerrero, Lukas Avendaño, Claudia Algara, Santo Miguelito, La Bala Damiana Cactaceae.